Does the Bible actually speak to the issue of addictions? That’s one of the common questions – or perhaps it’s more accurate to say veiled accusations – that I get when working with guys in our Recovery program. After all, the word “addiction” is not found in the Bible, nor doe the ancient authors of its text possess the current scientific knowledge that we do about addiction. How, then, can the Bible say anything worth considering about the nature of addiction? Ed Welch not only believes that the Bible addresses the issue, but he believes it is the best tool we have to help us address addictions. 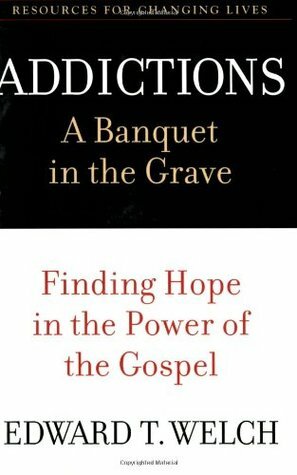 Addictions: A Banquet in the Grave is a comprehensive guide to the spiritual side of addictions that often get overlooked in counseling. His thesis explores the overlooked spiritual realities of addiction. We live in a day and age when the disease model dominates the conversation on addictions. Welch seeks to not only expose the weaknesses of this model, and there are many (see Kent Dunnington, Addiction and Virtue; Carl Hart, High Price), but, more significantly, to invite us to see beyond it. The Bible has many metaphors that are useful for thinking about addictions. Disease may be one of them, though even this is different from the contemporary usage of the term. But, “to reduce all discussion of addictions to one image is to sacrifice helpful perspectives that bring meaning and understanding” (45). There is much we can learn from the language and thematic developments of Scripture that are applicable to addiction counseling. Readers who explore the book will find the language of adultery, foolishness, attack, slavery, and idolatry are all useful lenses through which to look at this particular struggle. Welch does call it sin, but he avoids simplistic explanations that root the problem purely in choice. While he does not adopt a genetic or disease model in this book, he recognizes the lived experience of the addict and their feelings of being enslaved to their cravings. He gives, then, a more comprehensive treatment of the subject than either a disease model or a choice model does. The book is broken down into two parts. The first part, Thinking Theologically, sets up a framework for understanding the nature of addiction. He wrestles here with the ideas of addiction as sin, sickness, or both. He invites us to see the problem differently, through the lens of Scripture, making a compelling apologetic for the use of the Bible in addiction counseling. He also narrates the general descent into addiction. Both informed and novice readers to the field will find much here that they can agree with and yet much that will challenge them. Part two turns our attention to the process of healing. The book is written with both the addict and the counselor in mind, and so the chapters sometimes vacillate between their dominant relevance to each audience. Overall the chapters address matters of confronting, intervention, and speaking the truth. They invite counselors, family and friends, and the addict himself to speak the truth. Chapter nine, for example, urges the addict to confront head on the lies that they have chosen to believe, and aims to help equip counselors to assist in this confrontation process. Chapters 7 and 8 are significant in that they addresses knowing and fearing the Lord. Relationship with God governs Welch’s approach to recovery. The section concludes with practical wisdom on “saying no,” “staying violent,” and engaging with the Body of Christ. Each chapter concludes with practical tips and summaries for both the addict and the counselor. Welch calls it the “Practical Theology” section and seeks to help us apply in tangible ways the lessons that each chapter explores. Both addicts and counselors will find these sections useful, with lots to discuss and review together as you work through this book. Others may find it useful to summarize the chapters and assign parts of this Practical Theology section for continued work outside of a counseling session. Depending on where an addict is at in their journey it may not be useful to have them read through this whole book. While it is incredibly accessible, it sits at almost 300 pages and the theological foundation pieces in the beginning of the book are enough to make for some dense reading for a tired mind and body. It would be best to use Welch’s companion volume and workbook Crossroads, which we use in our Recovery program. But Addictions: A Banquet in the Grave sets a great deal of context for that work and would enliven anyone’s teaching through it. I highly commend this volume as a masterful treatment of addiction counseling that will address the spiritual components of counseling like no other work I have read.